You know, dogs are a big fan of fruits, such as apples, strawberries, oranges, and pineapples. But what about bananas for dogs? Can dogs eat bananas? If there is one fruit that most humans and animals like, that could probably be banana! Banana is one of the most favorite fruits because of its health benefits and the inexpensive price. And because there are an increasing number of health conscious dog owners nowadays, we know you like to know if the banana is safe for your furry friend. Dogs normally get their share of human foods from meat, veggies to fruits and banana could be one of these foods. However, there are a few numbers of fruits that are potentially toxic to them. There is no doubt that bananas are very nutritious, and many dogs prefer its sweet flavor. Fortunately, it is safe to give banana to dogs. With the numerous vitamins and minerals that banana has to offer, you can definitely incorporate it into your dog’s diet, but still, there are some restrictions to follow. Are Bananas Good for Dogs? As a responsible pet owner, it is our responsibility to check the nutrients that our pets can derive from their food. In case of the banana, this tasty treat is rich in potassium and vitamin C.
No doubt, it is extremely healthy for us, but are bananas good for dogs like they are for their humans? Potassium is essential for both animals and humans as it helps in sustaining the health of the muscles and nerves while maintaining the functions of the blood vessels. This mineral is also responsible for regulating the enzyme function and keeping that fluid balance inside the dog’s body. Bananas also contain high levels of vitamin B6, magnesium, and fiber. Magnesium serves as the building protein of the dog’s body while vitamin B6, which acts as anti-inflammatory, also supports proper function of blood cell and oxygen transportation. Moreover, Vitamin C helps prevent cell damage and enhance their immune system and promote bone formation. Fiber improves bowel movement. 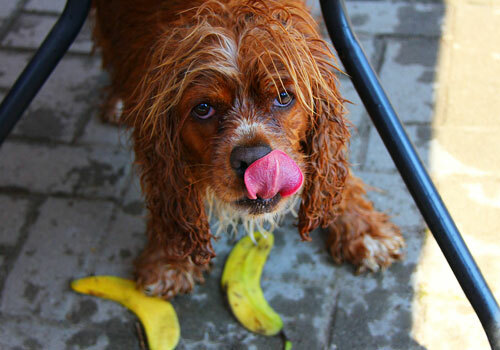 See how an inexpensive banana can give all of these nutritional benefits to your dog! We can even call a banana a super fruit. Unlike other commercialized banana dog treats and snacks, bananas are low in sodium and have no additives, preservatives, and food coloring. It is also rich in antioxidants, which can improve your dog’s overall health. Experts also believe that bananas contain other minerals and nutrients that will keep your dog’s skin and coat shiny. Bananas are also packed with a high level of soluble carbohydrates. When converted to natural sugar, it will also keep your dog playful and energetic. 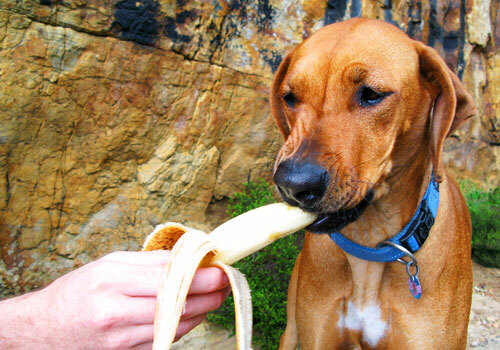 It will boost their energy; hence, banana for dogs work as awesome treats during training or physical activities. But like any other foods, may it be a dog food formula or human foods should come in moderation. Because there are numerous side effects of bananas for dogs if you feed them too much. 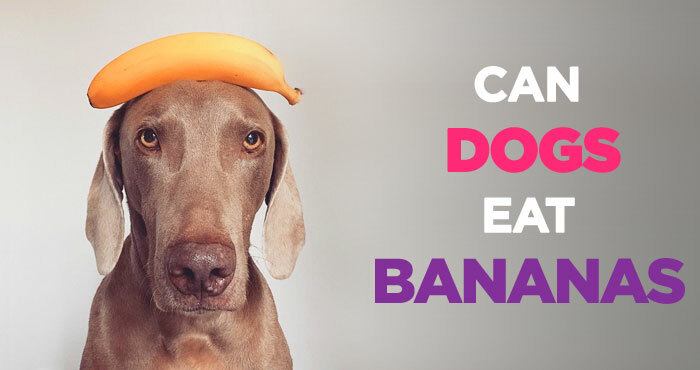 Whilst bananas are very nutritious and offer various health benefits, be careful not to overdo it with your dog. 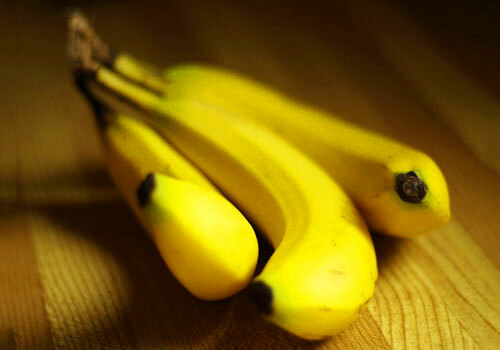 A vet from Banfield Pet Hospital agrees that bananas are way better as dog treats than those you can buy from pet stores such as baked biscuits or fruit-flavored sweets. Bananas have natural sugars while the latter has artificial sweeteners and flavorings. Thus, it is no surprise that most of us love bananas, and so are dogs. In next section, we will see how can dogs have bananas and get sick. We will also read about what are the health risks. Why Are Bananas Bad for Dogs? You must understand that not all dogs are the same. So while bananas in general, are safe for dog consumption, there are some restrictions and rules to follow when feeding them bananas. Giving them banana in moderation is the key. It applies to all most every food items for dogs. Below are some of the reasons why are bananas bad for dogs and how can they be harmful to your furry friend if consumed in excess. While potassium could be healthy for them, excessive potassium may cause heart problems in canines. Consuming a large amount of bananas may negatively affect the dog’s digestive tract and may result in an upset stomach or constipation. Potential problems such as diarrhea and allergic reactions might also occur so watch out for any signs of discomforts and illness when you start feeding banana to your dog. Definitely, banana peels are not healthy for humans and even for dogs. Although it also contains plenty of nutrients, the peel is not that easy to digest. There is also a chance that it will block your dog’s intestinal tract, which may result in severe damage. Bananas have lots of natural sugar and carbohydrates which could be a problem rather than beneficial for canines. Natural sugar can still contribute to weight gain and obesity. Bananas are a great source of electrolytes, which is crucial for dogs with diarrhea, but too many bananas can also cause them diarrhea! Better monitor the amount you feed him. Remember that canines are omnivores so aside from fruits and veggies, they heavily rely on meat-based products for their dietary needs. A little bit of it every day is completely fine, but don’t feed them with whole bananas. Likewise, banana chips should be eliminated from your list. More often, banana chips are packed with sulfites which is bad for dogs. banana for dogs should be given as treats just like other fruits, but it should never replace your dog’s natural food meal which is based on meat. These specially formulated dog food products are necessary for your dog’s health and growth. Some dogs would enjoy bananas, but others could despise it and can even develop a food allergy from it, so it pays to monitor your dog’s likeliness of bananas before you fully included it in his treats. In the next section, we will see how often can dogs eat bananas and how much should they eat. How to Prepare Bananas for Dogs? As a rule of thumb, only one inch of a banana should be given to medium and large size breeds. Remove the peel of course, to prevent indigestion and choking. For owners who love to bake and cook, you can get creative by baking some homemade banana biscuits for your dogs. Make sure to use ripe bananas for easy mixing of ingredients. These dog biscuit recipes are a healthy substitute for commercially prepared ones that are packed high-calories and preservatives. Peanut butter and banana biscuits are also a must try. Use a single banana to make one batch of it. This will get rid of the possibility of overfeeding your dog with bananas. Muffins are also a great alternative but make sure not to add raisins, chocolate chips and nuts if you intended to give these muffins and cookies to your dog. Those ingredients are proven toxic to dogs. If you will give banana as it is, slice it first and only give half of a single banana per day. You can also try mixing it with plain yogurt and serve occasionally. Unlike us, dogs are not after presentation as long as it smells and tastes good to them. You can use sliced bananas as a reward during their training. Providing them natural dog food is highly recommended, so we suggest you to avoid giving your dog processed banana chips. Moreover, moderation should be observed at all times. Too many bananas can cause constipation and may trigger other health issues. My Dog Ate Too Many Bananas! What Do I Do? Your dog might be sensitive to bananas so before giving them banana treats, consult the vet first. 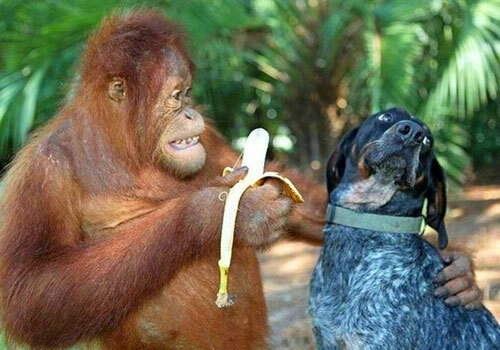 Other dogs just don’t like banana, and that is normal. Introduce them bit by bit and incorporate small servings in their diet. Look for changes in their weight or if your dog acquires sensitive stomach when you started giving him bananas. If for some reasons, your dog has eaten significant amount of bananas, closely monitor his condition. Look for signs of constipation, diarrhea or allergic reactions if there are any. You should also keep your veterinarian updated with your dog’s situation. Better pay a visit if possible. Don’t worry as eating too much banana in a day won’t really cause him to become ill instantly. It is safer if you will not make bananas part of your dog’s regular diet. Again, this should be only given as occasional treats so keep those bananas out of your dog’s reach! Or when you do, small slices should only be given. Remember that consuming excessive bananas over time can cause heart problems in your dogs because of its high level of potassium. Thus, give bananas, according to your dog’s age, preferences, and needs. To sum it up, below are the most frequent questions asked by dog owners and our answers be sure to remember and follow them. 1. Can dogs have bananas? Are bananas safe for dogs? YES. 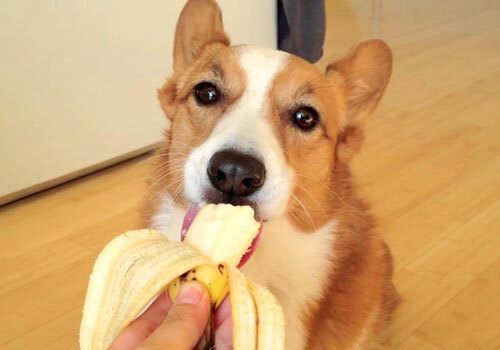 In general, banana for dogs are safe for consumption. In fact, my dog loves bananas. They can eat bananas moderately or as a dog treat. Bananas are packed with essential vitamins, minerals, and nutrients, and your dog can gain various health benefits from eating them. Whilst it is safe to feed them bananas, do not make it part of their daily diet or serve it as a replacement to their current dog food. Your dog still needs meat-based dog food products. 2. How much banana can a dog eat? Large and medium sized dog breeds could be given half a banana for a couple of times a week. The Smaller breed should be only given few, small and slices of banana also a few times a week. These are the safest guidelines you could follow. It is up to you to increase and reduce the serving as needed. Homemade banana biscuits or cookies must be given only as a treat. 3. Can dogs eat banana peels? Others would slice banana peels and create banana-based food products for their dogs, however, we suggest you steer clear of it. It is better to be safe than sorry! The peel could have pesticide residue which can terribly damage your dog’s intestines. It can also clog and block the intestines and cause digestive problems. To prevent these issues, better to get rid of banana peel. 4. Can dogs have green bananas? Green bananas are still safe to eat. However, we prefer ripe bananas or the yellow ones. Some green bananas could be tough to your dog’s stomach since most of it is unripe. The ripe ones can be thinly sliced or mixed with other ingredients. Still, they share the same vitamins and minerals that you can give to your dog. Make sure the bananas are peeled before serving them. 5. Do bananas give dogs diarrhea? Bananas contain fiber which supports better digestion, but if consumed too much, it can result to the opposite which is diarrhea. Your dog might also experience difficulties digesting the food which may lead to constipation. This is why moderation is very crucial. You don’t want your furry friend to suffer thus, only give them the required amount. 6. Can puppies eat bananas? Puppies and smaller dogs can still enjoy their share of banana but only for a limited serving and frequency. 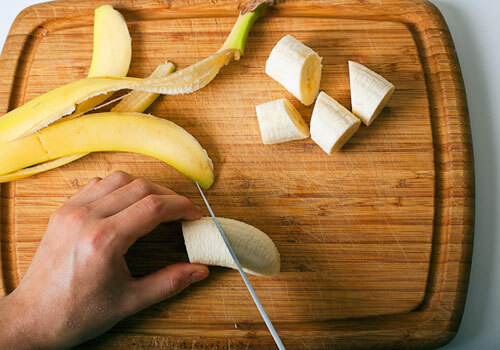 Thin slices of half of a banana could be given twice in a week or as a dog treat. But make sure not to spoil or treat them too often regardless how they love bananas. You might unknowingly overfeed your dog. Dog owners like you are in search of the best dog food varieties and healthy alternatives which is understandable. We would only want the best and healthy options for our canine buddies which we treat as families. So what’s the verdict on bananas for dogs? Can dogs eat bananas? Yes. They can. Dogs and bananas are a great pair so to speak. 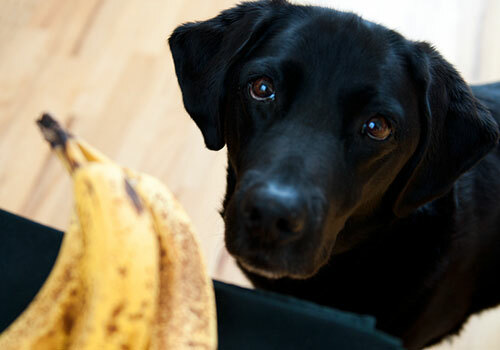 Fortunately, bananas make it to our list of healthy food for dogs. And like any other food, whether it is a dog food or human food, proper serving and limitations must be observed. 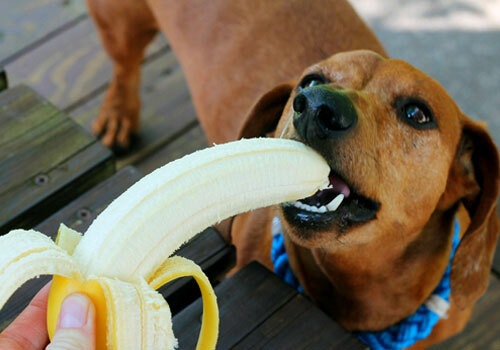 If given properly, dogs can reap the many benefits that bananas have to offer. Plus, this fruit is relatively cheap and extremely nutritious. Fruits in general, require a specific digestive enzyme to break down. The enzyme is different from the ones they use to break down meat and vegetables. Thus, feeding your dog with fruits, veggies, and meat all at once will result to indigestion. If you are to feed your dog with a banana or other recommended fruit, make it an hour before his actual meal. This will give him ample time to digest the fruit before he takes another meal. If you will give it as a treat after a meal, wait at least for 2 hours. This will help him properly digest all the food he has eaten. Most of all, stick to the moderation principle. 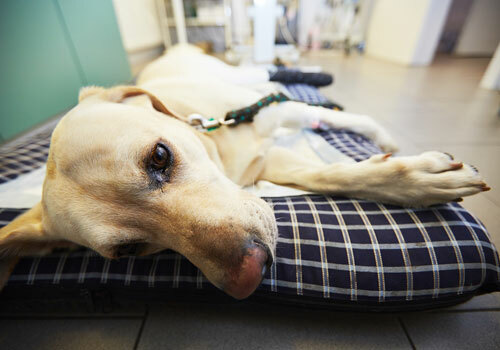 Remember that giving your canine buddy too much of everything will put his health at risk.